Vintage From Paul is pleased to offer these classic Mayer China Company Delmar Luncheon Plates. The Mayer China Company Delmar Luncheon Plates have a transfer print border decoration featuring an intricate floral/vine design . The pattern was manufactured from the 1920's to 1950's. Each of the available Mayer China Company Delmar Luncheon Plates is in Excellent condition with no chips, cracks, staining or crazing. The graphics are crisp, color vibrant and glazing smooth. 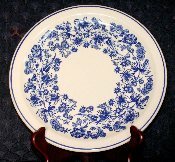 The Mayer China Company Delmar Luncheon Plates measure 9-1/2 inches in diameter. The Mayer China Company Delmar Luncheon Plates are marked with " NaroRim, Mayer China, Delmar, Mayan Ware".